Hope reposting this from another forum is ok. This is the report of a burglary of a gun store in Fresno, CA. Posting it here in case any of these show up in Nevada. We were hit early Tuesday morning. He was only able to obtain handguns. The count is 36. The majority of those are standard Calif. approved models. (7) of them are very unique. Not common handguns. I don't believe this individual is even from our area. The individual is skilled with alarms. He was able to defeat our alarm system with cell phone back up. We have motion detectors throughout the building and rooms. He worked from above our alarm boxes. Unfortunately they have been in the same location for 10 years. This has been changed. There was a motion sensor less than 2 feet away from where he was working on the alarm. The other motion sensor which should have detected him was partially obscured by a cabinet. He used a roofing ax to make entry, cut wires, and break open secured storage for the handguns. He wore a headlight with a secondary handheld. Complete hood with eye port only. We made some errors for sure. This was a total loss for us. There will be no insurance claim. Insure your alarm system is set up to alert if the phone lines get cut. Unknown to me our cell phone or radio alarm was our primary with no secondary means of contact. The alarm receiving company set up that way. I did not know I needed to ask for a land line. I thought they would just do it. If your control box is in an obvious place, or located high near a ceiling, consider moving it. I can not overstate the importance of 1080 cameras. Higher resolution cameras will make all the difference. 740 is not enough. Fine detail is lost. This could mean not identifying subtle clues like tattoos, license plates, shoes, tools being used. Almost pointless to have cameras if they lack the ability to see details. I am posting this to certainly inform those of you concerned with these things, and also to get the word out on my handguns. My loss was significant as was Tinos. Most of mine are not replaceable or too much work to do again to just replace. I offer $5,000 Cash to the recovery of my guns no questions asked, or information leading to the recovery of them and the arrest of the individual. Glad I have a place like Calguns to get the word out. Unique Features- 1911 Style. Frame Caspian manufacture and Slide Caspian manufacture. Custom hand build by me. Leupold Delta Point mini holograph red dot sight mounted onto a milled recess of slide. Back up iron sights with green fiber optic front sight. Mag well funnel. 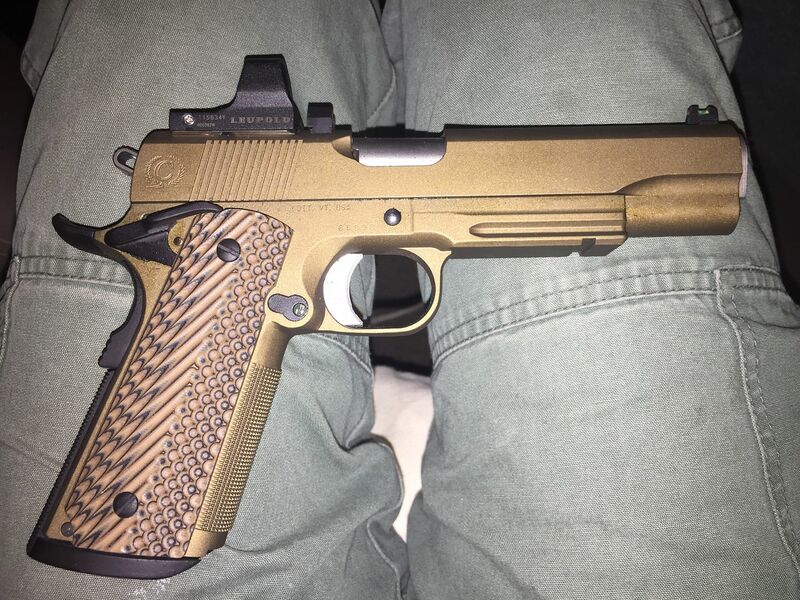 Unique Features- 1911 Style. Frame Para Ordnance with a Colt Government Slide series 70 slide assembly. Adjustable rear sight and fiber optic red front sight. Frame lower grip cut for magazine funnel. Wood grips. Grey color main parts with silver colored smaller parts. Unique Features- 1911 Style. Frame Para Ordnance and Slide Auto Ordnance brand. Gold colored barrel. Unique Features- 1911 Style. Frame and Slide both Smith & Wesson brand. Fiber optic front sight. Wood grips. Black accents. Unique Features- 1911 Style. Frame and Slide both Springfield. Factory handgun with SS mag funnel, VZ grips in Grey and fiber optic front sight. 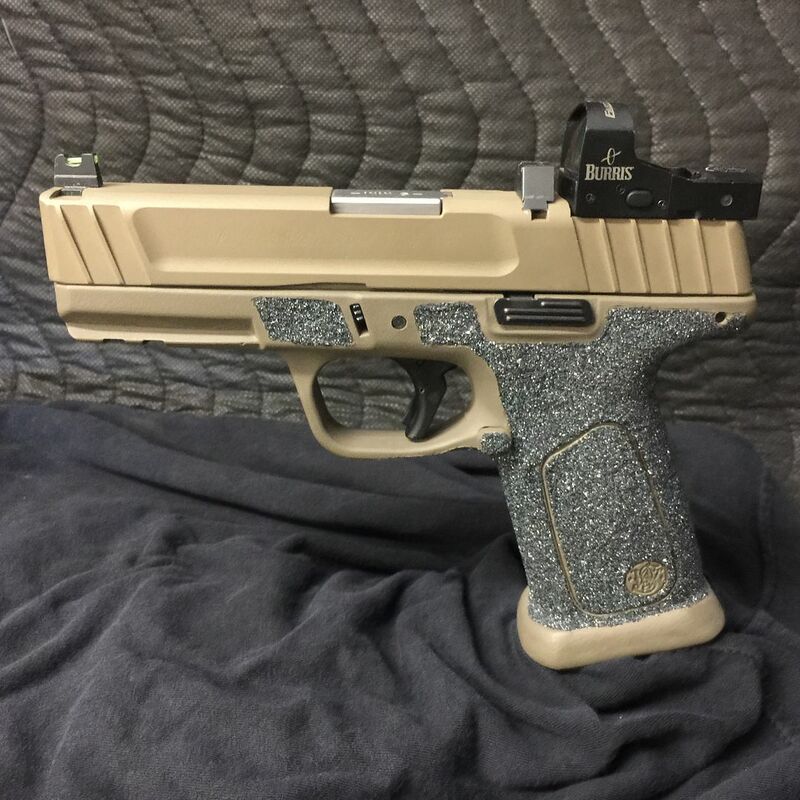 Unique Features- Glock 19 frame with molded in mag funnel. Very distinctive appearance. Stainless Steel Slide with forward grasping serrations. Slide is milled down in the rear with a Trijicon brand RMR mounted mini holograph sight. Dot color is amber. Back up iron sights. Bar-Stow Match hand fitted Match barrel in 9mm. Lastly this Hi-point I did as a gift for Tino. Consider it an exaggeration of a style. Not meant to be taken seriously. Wow that is sickening. As he states, most of those handguns are irreplaceable. That is too bad. That hi-point looks pretty sweet.